The Kornati National Park is one of the stops on the route R2, Croatia cruise through the Kavarner islands and Northern Dalmatia. From 11:30 am to 1:00 pm, boarding time in the port of Rijeka. If you arrive by your own car, you can proceed to the port already from 10:00 am. Our service-team will lead you to the garage where you can leave your car. Of course, they will also bring you back to the port. After embarkation, our representatives will welcome you aboard with a drink and you will meet the crew and your fellow passengers. After a lunch snack “Cast off!”, heading towards the island of Krk. We will moor in a bay to dive for the first time into the beautiful waters of the Adriatic Sea. Then we continue on to Krk, the capital of the island, or Punat, where we will moor for the night. After breakfast, we set off for the next island – Rab. After about two hours, we will drop anchor in a romantic bay – here you will have plenty of time for swimming and sunbathing. We will reach the town of Rab in the late afternoon. A guide will await us to take us on a guided walk. 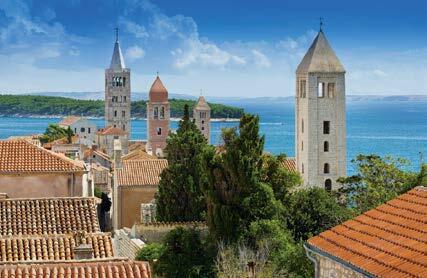 The old town of Rab, with its impressive bell towers, stretches around a narrow, rocky promontory, flanked by water. Three streets pass through the old town – the “Lower Street” (Donja Ulica) with cafés and pubs, the “Middle Street” (Srednja Ulica) with boutiques, souvenir shops and ice cream parlours, and the “Upper Street” (Gornja Ulica), which leads to the four churches with their bell towers. Overnight stay in Rab. Today, we will leave the Kvarner Bay and head to Dalmatia. After a swim at the small island of Maun, we will reach Zadar, the centre of northern Dalmatia. 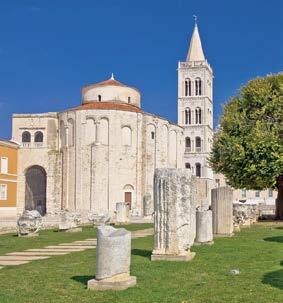 After arriving in Zadar, a local tour guide will await us to take us on a walk through the walled old town, showing us unique sights like the Roman Forum, the circular church of St. Donatus, or the Cathedral Sveta Stošija (St. Anastasia). Enjoy traffic-free streets with elegant boutiques and countless cafés, or listen to the sounds of the worldwide unique Sea Organs on the Riva, their melodies created purely by waves. Overnight stay in Zadar. Surely the highlight of our trip! According to the Irish author George Bernard Shaw (who received the Nobel Prize in Literature in 1925), ”On the last day of creation, God crowned his work, and thus created, out of tears, stars and breath, the Kornati Islands”. The beautiful scenery, countless small and large islands (according to local lore “an island for every day of the year”), and the beautiful sea – all this makes the Kornati Islands a unique paradise. It is the largest and most dense archipelago in the Adriatic Sea – it comprises 147 islands, islets and reefs, with a total area of 69 km 2 , spread over 230 km 2 . They cover an area of 35 km of length and 13 km of width among the islands of Dugi Otok in the north-west, Žirje in the southeast, and Pašman, Vrgada and Murter in the north and northeast. From Zadar, we will continue our cruise, passing the strait between the islands of Dugi Otok and Pašman and heading towards the “Proversa”, a narrow passage between the islands of Dugi Otok and Kornat, which is the entrance to the unique National Park. Passing countless, mostly uninhabited, islets we will reach the island of Mana, which on one side gently slopes into the sea, while on the other side it is marked by high cliffs. The ruins at the highest point of the island are not remains of historic times, but scenes of the movie “As the Sea Rages”, filmed here in the late 1950s, starring Maria Schell. In the afternoon, we will continue towards north and anchor at one of the numerous islands of the beautiful Zadar archipelago – Dugi Otok, Zverinac, Molat or Olib. We head towards the island of Lošinj, which is not only known for its 300 cloudless or only slightly clouded sunny days per year, but also for being covered by dense pine forests. With a bit of luck, we will maybe spot dolphins playing in the waves; in the waters around the island of Lošinj, there are more than 160 dolphins registered by the “Adriatic Dolphin Project”. After a swimming break, we will reach Mali Lošinj, where we will spend the evening and the night. Today we will sail to the neighbouring island of Cres, which is connected to Lošinj by a pivot bridge in Osor. The striking feature of the island are the endless olive groves and the innumerable flocks of sheep. Needless to say, that roast lamb is one of the specialties of the island of Cres. After the obligatory swimming break, we will head towards the picturesque town of Cres, where we will stay for the night. Time to say goodbye to the Croatian islands. 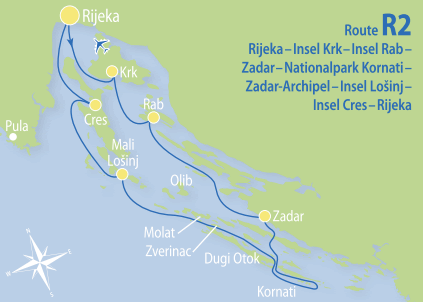 from Cres we will cruise along the eastern shoreline of Istria to Rijeka – not without taking one last dip into the sea. Overnight stay in the port of Rijeka. The itinerary could also be done in reverse order.